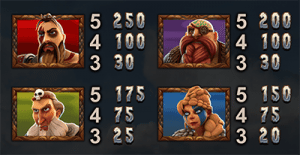 Vikings Go Berzerk is a bonus-packed pokies game from software provider Yggdrasil, offering a mythological theme executed with flawless graphics. Find out how to play this exciting new title for the chance to win real money at the best casinos on the Web. Vikings Go Berzerk is a five-reel pokies game with 25 fixed paylines paying from left to right. The reels are set out at sea inside an imposing Viking ship, with a series of Viking characters sitting at the bottom of the reels to help you collect free spins along the way. The game is accompanied by a dramatic soundtrack to help set the scene, and this is definitely one you’ll want to play with the volume on. Along with impressive graphics and entertaining gameplay, it’s the bonus features that really gives this game its essence. 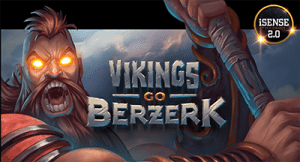 Vikings Go Berzerk offers such unique bonuses as rage meters, berzerk mode, free spins, treasure chest bonuses and more, with plenty of exciting chances to boost your winning potential. The theoretical RTP in Vikings Go Berzerk is 96.1%. Vikings Go Berzerk is an instant-play game, so it can be played directly over your Web browser without having to worry about any downloads. Paylines are fixed, so all you need to do to play is select your desired coin value, with minimum bets starting at $0.25 and maximum bets capped at $125.00. It can be played for free in practice mode or for real money bets at leading online casino, Slots Million. Payment methods available include Visa, MasterCard, Skrill, Neteller, Paysafecard and direct bank transfers. High paying symbols in Vikings Go Berzerk. Treasure Chest – An appearance of the treasure chest symbol anywhere on the fourth reel gives you the chance to choose between five instant prizes. If it lands during the base game, you’ll either win from seven to 21 free spins or a coin win between 50 and 1,000 coins. It the treasure chest appears during free spins, prizes become even higher, awarding coin wins, additional free spins, extra wilds and a wild reel. Golden Treasure Chest – This bonus works the same as the above, but the Golden Treasure Chest is even more valuable. It appears only on the fifth reel, and during the base game will award anything from seven to 21 free spins, a coin win of up to 10,000 coins, Ragnarök free spins and a rage boost. If the golden treasure chest appears during free spins, you can get more spins, coin wins, two extra wilds or a wild reel. Rage Meter bonus in Vikings Go Berzerk pokies. Rage Meter – Sitting at the bottom of the reels you’ll notice there are four Vikings, each which starts to collect a fiery ring around it as certain combinations are landed. This forms the Rage Meter, where Vikings collect rage each time you win with their corresponding symbol, with bigger wins earning you more fuel for your fire. When a Viking’s rage meter becomes full it will award you seven free spins with that Viking transforming into Berzerk Mode. Free Spins – Free spins are triggered by three or more of the Free Spin scatter symbols, with more spins awarded the more scatters you land. Before your free spins are played out, you’ll also be rewarded at random with one additional bonus, which can be extra free spins, a sticky wild placed in a random position, a reel that becomes wild, extra treasure chests, or all Vikings becoming Berzerk. Berzerk Mode – If you fill your rage meter your Viking will go into Berzerk Mode when free spins are triggered, which means a guaranteed win against the siren to successfully become a sticky wild. Vikings Go Berzerk is a perfect example of the quality of online game we expect in 2017, and it’s great to see Yggdrasil setting the bar high. This game really has it all – excellent graphics, an exciting theme, multiple bonus features and above all, innovation. We’ve never seen something like the Rage Meter used before and it’s exciting to see that a software developer still has the ability to surprise us.